 A reliable source for Ceramic Manufacturing information and a resource for accessing leading Ceramic Manufacturing and suppliers. Ceramic manufacturing is the process used to sinter and fabricate ceramic materials into non-metal parts. The term “ceramics” refers to a wide range of products and materials used for an equally wide variety of applications, from commercial uses to the aerospace industry. They may come in the form of powdered composites or semi-liquid inorganic materials. 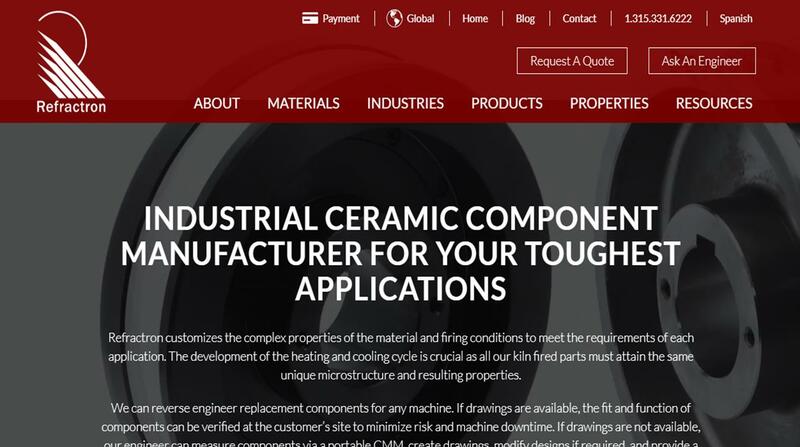 Regardless, the unifying characteristics of all ceramics include extreme high temperature resistance, wear resistance and hardness and a crystalline structure. Ceramic Manufacturing Ceramic manufacturing is the process used to sinter and fabricate ceramic materials into non-metal parts. The term “ceramics” refers to a wide range of products and materials used for an equally wide variety of applications, from commercial uses to the aerospace industry. 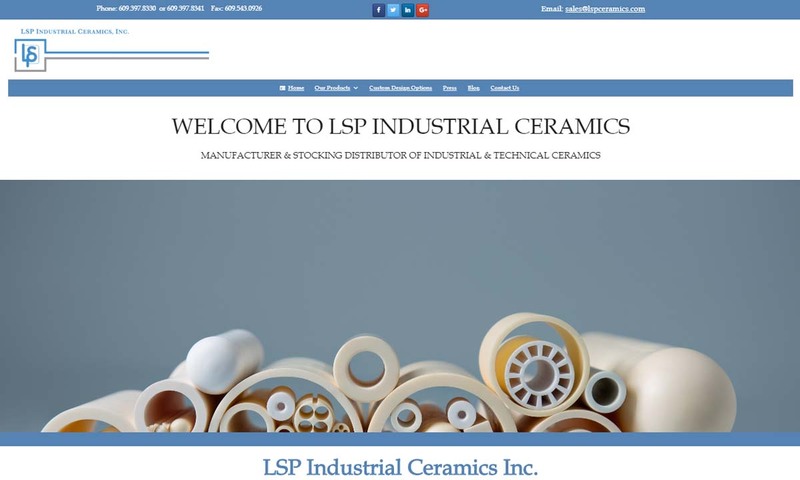 As a manufacturer and stocking distributor of industrial and technical ceramics, LSP carries the most diversified inventory of ceramic tubes, spacers, bushings, etc. in the industry. 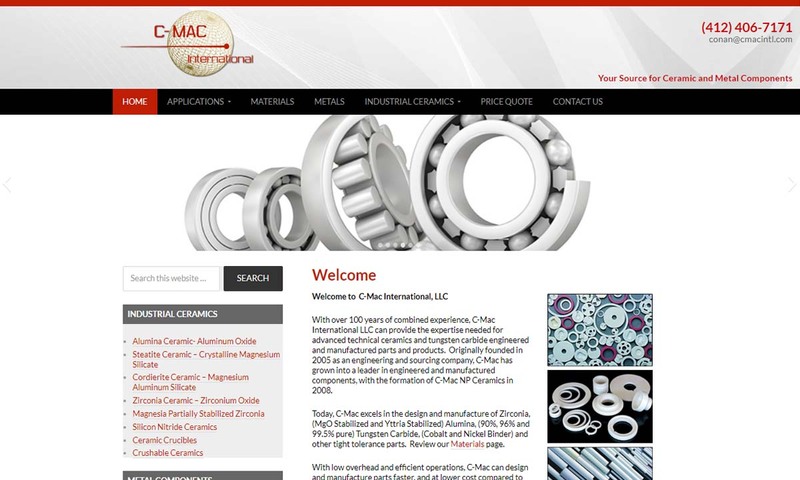 C-Mac International, LLC is a custom ceramics supplier. 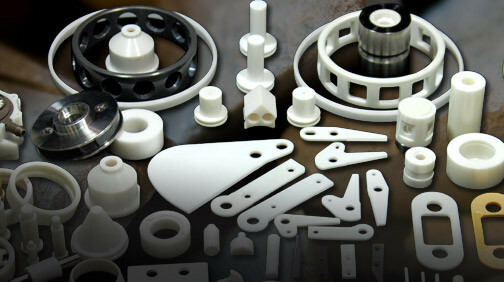 We provide advanced ceramic component parts manufacturing for a variety of industries and provide solutions to many ceramic needs. Years of experience have created unique specializations and expertise of our engineering and product consultation team. Applied Ceramics has a proven track record in creating the highest quality products for semiconductor processing equipment, automotive ceramics, cutting tools and many other industrial ceramics. 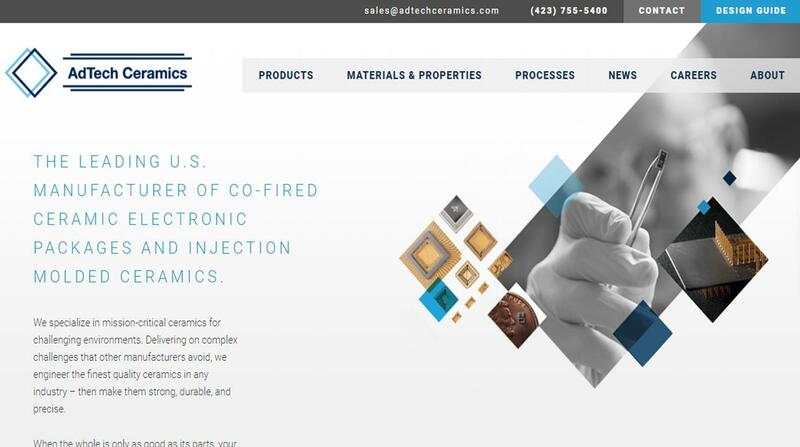 AdTech Ceramics manufactures co-fired ceramic electronic packages and injection molded ceramics. As an AS9100D, ISO 9001:2015, and NADCAP certified business, you can trust that our products are fabricated under strict quality control and you will receive a superior product. Refractron partners with companies that have fluid control applications requiring plug, seat, ball & seat or check ball components to name a few and that require a lower cost, strong, tough product of low wear. Ceramic products can be divided into four main categories: structural ceramics (bricks and ceramic tiles (wall tiles, floor tiles, etc. ), refractories (ceramic kiln linings, crucibles and other high-heat applications), whitewares (bone china for dining and other decorative pottery) and technical ceramics, also called engineering ceramics or advanced ceramics. Ceramic Materials – LSP Industrial Ceramics, Inc.
Advanced ceramics are high-performance ceramic parts used specifically in nuclear power, aerospace, biomedical, defense, military and automotive applications that require especial insulation and/or heat, wear and corrosion resistance. Ceramic biomedical applications include bone and tooth replacements, prosthetic limbs and blood sugar sensors. U.S. soldiers receive protection from alumina ceramic and boron carbide ceramic body armor. Ceramic parts and ceramic magnets help electric motors withstand engine heat. In addition, ceramic products can be categorized as electrical ceramics and ceramic coatings. Electrical ceramics include: ceramic insulators, magnets, capacitors and superconductors. Ceramic coatings are used to reduce chemical corrosion and surface temperature of engine components and industrial wear parts. Also, chemical and environmental ceramics are used as fibers, membranes and catalysts that absorb toxic materials, decrease pollution, help with water purification and the like. Ceramic industrial products include ceramic bearings, balls, insulators, and rods. As pottery and for decorative purposes, ceramics have been used for thousands of years. For example, Egyptians were decorating their homes with ceramic bricks as early as the 4th millennium BC, and ceramic tiles were used to decorate the famous Ishtar Door of Babylon. Clay is the oldest ceramic raw material. However, industrial ceramics have only been around since the 18th century. In 1709, Abraham Darby combined coke with clay in order to improve the efficiency of the smelting process used at his production facility. His successful venture was the first recorded use of ceramic engineering in modern history. Half a century later, Josiah Wedgwood of Stoke-On-Trent, England, opened the first ceramics manufacturing factory. In 1880, brothers Pierre and Jacques Curie piezoelectricity, the door into electroceramics, also known as piezoelectric ceramic manufacturing. In 1888, Austrian chemist Carl Josef Bayer invented a process for isolating and separating aluminum from bauxite ore. This process made it much easier and cost-effective to create diverse ceramics. That’s why it is still used today. In 1893, E.G. Acheson made another significant advancement in ceramic manufacturing, when he invented a process for creating silicon carbide. Throughout the earlier part of the 20th century, thanks in part to World Wars I and II, ceramic manufacturers continued to rapidly develop new, and finetune existing, ceramic material manufacturing processes. Meanwhile, manufacturers and engineers persisted in improving and advancing forming and fabricating processes. Together, for WWI and especially WWII, they produced a vast number of safety equipment components and arms. During the almost 20 years we’ve been in the 21st century, scientists, engineers and manufacturers have come up with even more kinds of ceramic material and ways to form it. One of the new popular ceramic materials is hydroxyapatite, a synthesized version of a natural mineral component found in bones. Using hydroxyapatite, manufacturers can now create products for the bioceramics industry, like dental implants and synthetic bones. Furthermore, some processes, like the launch of space shuttles and missile cones, would not be possible without ceramics. In addition, Japanese engineers are now using ceramic magnets to make trains levitate. As such fascinating research and development continues, there’s no telling what innovations the ceramic industry may bring us in the future. Continued points of research and development include: how to ceramic mold for complex designs, how to ceramic mold parts with higher precision tolerances and how to make ceramics less susceptible to breakage. Alumina ceramic materials are made from alumina oxide, also known as aluminum oxide, a chemically stable material with high ionic atomic bonding properties. It is most often injection molded or isostatic pressed. As a product material, it offers strength, hard surface, superior surface finish, corrosion resistance, damage resistance and electrical insulating properties. Alumina oxide is popular for ceramic applications in electrical insulation systems and semiconductor compounds. Aluminum nitride is a synthetic alumina ceramic material, made mostly from aluminum and nitrogen. It is covalently bonded. It has both high thermal conductivity and strong dielectric qualities (able to transmit electric force without conduction; electrically insulating). At temperatures above 3632℉ (2000°C), it is still stable and inert. The curious mix of characteristics held by aluminum nitride makes it an excellent ceramic resource for renewable energy, electronics, optics and lighting. Ceramics materials manufacturers make steatite ceramic materials primarily from magnesium silicate. Steatite ceramic products are strong, durable and excellent electrical insulators. Steatite ceramics have such good insulation properties that they are used frequently in thermostats. They are also common elements of commercial and residential electrical parts. Zirconia ceramics, not to be confused with cubic zirconia, come from zirconium oxide. They are highly breakage resistant and corrosion resistant. As such, they are essential materials for highly sensitive and heavily used ceramic components, such as dental ceramics and automotive oxygen sensors. Silicon carbide ceramic materials are created from small bits of silicon carbide processed through sintering, a process involving high pressure and intensity. These strong and durable ceramics are used in the production of automotive clutches and brakes. Silicon nitride is made up mostly of silicon and nitrogen. It offers its users: creep resistance, good thermal shock resistance (especially when compared to other ceramic materials) and stability and strength at high temperatures. Examples of common silicon nitride ceramic applications include: turbine blades, cutting tools, thermocouple sheaths and welding nozzles. Mullite ceramics are made from the material of the same name. Mullite ceramics have unmatched high temperature resistance and strength. They are a great resource for applications that require low thermal conductivity within low-pressure, high thermal expansion environments. However, because mullite is such a rare natural material, mullite ceramics are more expensive than other ceramic materials. Ceramic glass is not actually glass, but rather a transparent ceramic material. Unlike real glass, it can endure continuous high temperature exposure without distorting or breaking. It is a common solution for wood burning stoves and fireplaces with glass panels less than 6 inches from the flame. Clay is the oldest and most basic ceramic material. Clay is not used to make industrial ceramics, but rather more traditional ceramic products, such as: bone china, porcelain, stoneware and earthenware. The standard industrial ceramic manufacture process goes through several stages, including: milling, batching, forming, drying, sintering and finishing. Milling is a stage during which manufacturers give raw material a small, predetermined shape. They modify this raw material via a number of sub-stages, including: destructing, compressing and impacting. During batching, manufacturers build the ceramic material by amassing materials, per the predetermined ceramic preparation method. During this stage, they also manufacture additives. The additive manufacture step allows manufacturers to further develop, modify, improve and specialize ceramic material characteristics. During mixing, manufacturers mix all of the ceramic ingredients together. Frequently, this means turning the materials into slurries by mixing them with water or another liquid additive. Next, now that the base has been prepared, manufacturers begin the fabrication of the ceramic products themselves. To do so, they may use any one of several forming processes, such as: slip casting, pressing, extrusion or injection molding. Slip casting, a type of mold casting, works exceptionally well with the mass production of sanitary ware, thin walls and complex shapes. Examples of pressing methods include hot pressing and hot isostatic pressing. These are best suited to advanced ceramics. Both of these processes are molding processes and both are best used for the creation of simpler ceramic products, like pipes and tubes. Now it’s time to dry the newly formed ceramic part completely. Manufacturers do this in order to solidify the ceramic shape. During sintering, manufacturers put the ceramic piece, now known as greenware, in an extremely hot oven or chimney. Inside, the ceramic greenware strengthens as its oxides bond and desifacte. In turn, this chemical process causes the formation of ionic bonds, covalent bonds and the ceramic’s crystal structure. Sintering also involves cations. By calculating the difference of electronegativity between cations and anions, you can determine the ionic structure. The cherry on top of the ceramic manufacturing process is finishing. To finish a ceramic piece, manufacturers can put it through secondary processes including: machining, glazing, cutting, grinding or polishing. During the design phase of ceramic manufacturing, product designers focus on catering to the application. With that in mind, they make decisions on: material, wall thickness, product shape and size, what processes to use, etc. Using such considerations, it is easy for them to make custom ceramic parts. Any ceramic manufacturing system can be customized to fit the application(s) on which it is working. Customizations are typically based on factors like: required production volume and speed, quality requirements, shape complexity, and secondary processes. Ceramic manufacturing offers its users and the users of its products many benefits. While ceramic parts are routinely more expensive than their traditional metal, rubber or polymer counterparts, their long-term benefits almost certainly outweigh the disadvantage of their initial costs. These long-term benefits include: triple the performance reliability, cost-effectiveness and outperformance in harsh environments. On top of these, ceramic manufactured parts are lightweight and have high melting points, high hardness (some harder than titanium), good oxidation resistance and excellent corrosion resistance (often matching that of stainless steel). In addition, some ceramic products can conduct electricity better than copper. Advanced ceramics give missile cones and space shuttles the heat insulation they need to not crack under extreme heat and pressure. Finally, ceramics can be environmentally friendly; in the right setting, they can be used to absorb toxic waste and purify water and/or decrease pollution. If you think ceramic manufacturing is right for you, the next step is finding a manufacturer you can trust. That can be hard, as so many companies out there focus on their bottom line and profit, and the cost of quality. We don’t want you to end up with one of them; they’ll cause you far more headaches than they or their products are worth. To that end, we’ve put together a list of leading manufacturers that we endorse. As you’ve likely already noticed, their profiles are interspersed throughout this page. We recommend you spend some timing browsing these profiles. While every ceramic manufacturing company we’ve listed here offers quality and good customer service, you will only work with one. So how do you choose? Our best advice is to go with the manufacturer that offers products, services and prices that best fit your needs. To find out which one that might be, after browsing, pick three or four which whom you’d like to speak directly. Then, reach out to each of them with your specifications, requirements, questions and concerns. Once you’ve done that, compare and contrast your conversations and make your choice. Good luck!